There was also an Italian ducat silver coin, value about 3s. 6d. In 1284, the first gold ducat, also called a zecchino (from which we get the word sequin) d'oro, was struck at Venice under the doge John Dandolo. This coin, worth about 9s., bears on one side figures of St. Mark and the Doge, and on the other a figure of Christ with the legend 'Sit tibi Christe datus quem tu regis iste ducatus'; this, though it did not originate, may have contributed to spread the name, which was subsequently applied to the gold coins of various European countries. 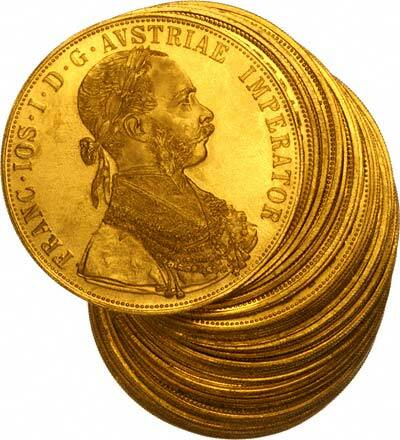 Ducats were issued by Austria in 1612, and possibly earlier. The last regular issue of ducats was in 1914. 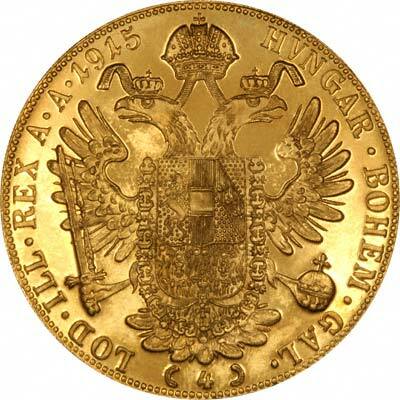 All the 4 ducats dated 1915 are restrikes, of which there were 496,501 struck between 1920 and 1936. 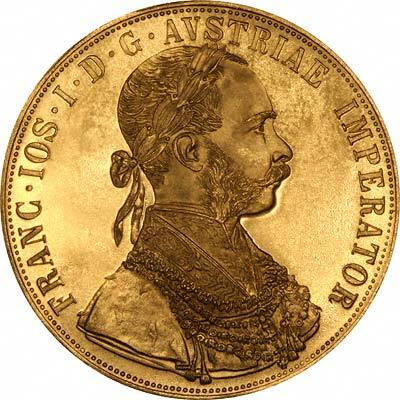 Four ducat coins dated 1915 are still being produced by the Austrian Mint as official restrikes. Because they have inherited their design and appearance from medieval gold coins, they are very thin compared with modern coins, at just 0.7 mms. thick. We know that our prices are always reasonable and competitive, and we generally expect to beat our competitors' prices, but we were surprised recently to see these coins being advertised at £195 each, so it looks as though either our competitor is ripping people off, or we are selling our coins too cheaply. (At the time, our price was £101).